The obvious on a sunny and warm day: go swimming in one of the three lakes. Lake Neuchatel has beautiful beaches on its Western shore. Go water skiing! If you don't have access to a boat you can drive to Estavayer-le-lac and use the water ski lift. You may rent a wakeboard or waterskis there as well. Go for a stroll in the old cities of Estavayer-le-lac or Yverdon. Beautiful medieval architecture and comfy cafés will be part of the experience. 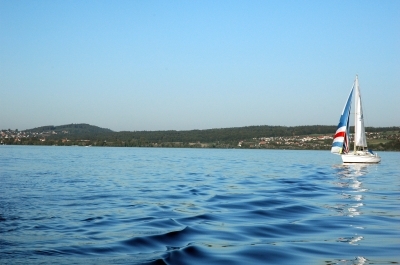 Take a boat ride on one of the lakes. I believe there are also rides that cross from one lake into another through the canals that connect them. Visit Grandson castle! If you're interested in history and old buildings this old castle overlooking Lake Neuchatel might just be the thing for you! Head out for a game of laser tag in Bienne/Biel. For 13 CHF you're in! PS: For those of you who still want to go to the Street Parade 2013 check out the official website for information.